OFTEN times, when people retire from public service, they sit back and sluggishly live on their pension. And when the pension funds run out, some become impoverished. But, that is not the case with Lobby Benny Muntu-Umo. After teaching for 32 years in 11 government schools and having retired from public service, Muntu-Umo has continued to teach industriously at his private school. Muntu-Umo was born in 1956 in Mufulira on the Copperbelt Province; he is the first born child to Lobby Muntu-Umo and Emelia Kapelembe. 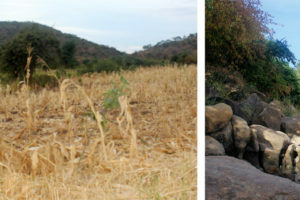 At seven, Muntu-Umo was enrolled in sub-A at Winter Muleya Primary School in his native town. In 1967, government changed the primary education grading system from sub-standards to grades. It was also the year Muntu-Umo moved to Kankonyo Upper Primary School to do his Grade 5. 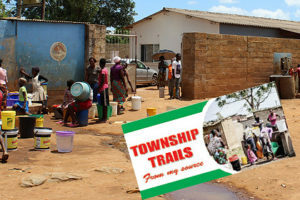 The following year, the family moved to Luwingu in Northern Province, where Muntu-Umo continued his primary education at Chabukasansha Primary School in Chief Chitukubwe area. In 1969 after his grade seven examinations, Muntu-Umo applied for priesthood training at Lubushi Seminary in Kasama. Unfortunately, he was not accepted. In 1970, he repeated the seventh grade and once again failed to secure a secondary school place. Although Muntu-Umo was a clever student, the move from urban Mufulira to rural Luwingu made him severely susceptible to malaria which affected his academic performance. 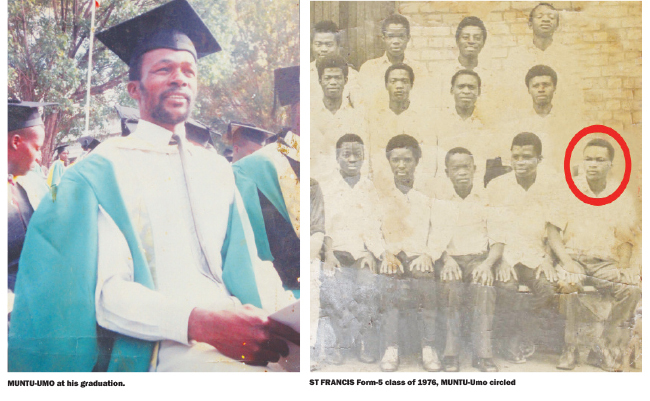 However, in 1971, Muntu-Umo sat for the grade seven examinations for the third time and made it to form-one at St Francis Secondary School in Kasama. There, Muntuâ€“Umo became the usual clever student and scooped a third best position of the schoolâ€™s academic excellence. St Francis school administration recognised the best three students in each grade and awarded them with a performance certificate. Muntu-Umo recalls that in form-one when he got the third place, the second position was taken by Godfrey Kapikwa and Charles Malata got first position, a place he stuck to through to form-five. Muntu-Umo and Kapikwa interchanged the second and third position between them. It was at St Francis where Muntu-Umo schooled with former energy minister Kenneth Konga and former Post managing director Fred Mâ€™membe. In 1976, after his secondary education, Muntu-Umo went for National Service at Mushili Camp in Ndola. He was part of the second group after the maiden intake the previous year. Muntu-umo was among other instructors, drilled by Major Richard Kachingwe who was then Sergeant and instructor in Political Education. The 20-months National Service training was a life changing experience, for the school leavers. During the training the recruits learnt about survival skills including knowledge in food production. In 1979, after undergoing National Service, Muntu-Umo returned to Luwingu and joined government as an untrained primary school teacher. His first posting was at Mubili Primary in Chief Matipa area where he taught for a year before being transferred to Shitimali Primary School in the same area. After teaching for barely a month at Shitimali, Muntu-umo was called for military mobilisation to reinforce border security on the Zambia-Zimbabwe border during the neighbouring countryâ€™s reign under Ian Smith. And after the military engagement, Muntu-Umo returned to his teaching job, this time at Chifomfwe Primary School in chief Tungati area. In 1981, Muntu-Umo applied for primary school teachersâ€™ training at Mufulira Teachers Training College. While at college, he established a cultural troop, founded the institutions philosophical society and chaired its debate club. His other co-curriculum activities included writing for the college newsletter and being secretary of the Red Cross Club. On graduation Muntuâ€“Umo was among the best three students and he received the best art student award. Now, a trained teacher, he was posted to Chimbwi Primary School in Luwingu district where he only worked for three months before being transferred to Ndoki Primary school. And after a one year and six months stint at Ndoki, Muntu-Umo was again transferred to Shimumbi Primary School. It was at Ndoki, where Muntu-UmoÂ was recommendedÂ by theÂ Northern Province district Education officer to go for training at Chalimbana Teachers In- Service Training CollegeÂ in Lusaka. The most transferred teacher was to undertake training in Remedial Education; a course designed to train teachers to handle leaners with special needs. However, when Muntuâ€“Umo travelled to Lusaka for his training, the said course was not available. Immediately, he returned to Luwingu and got posted to Chiponde Primary School near to Luwingu Boma. The proximity to the main district offered him an opportunity, to study for the University of London, O levels examinations. In his spare time, Muntu-Umo did his self-taught studies for the British O levels. Although his qualifications were for primary school teaching, Muntu-Umoâ€™s exemplary teaching pedigree earned a place to teach at Luwingu Secondary School where he taught English and French. His individual brilliance quickly earned him the position ofÂ head of French department. But his teaching stint at secondary school was short-lived when he got transferred to Tungati Primary school. In 1989, equipped with the primary teacherâ€™s qualifications, established teaching experience and British O levels, Muntu-Umo entered for University of Zambia Mature Age Entry Scheme examination, for Bachelor of Arts with Education. The programme required him to successfully pass eight courses through the long distance training before admission as a full-time student for the final two- year training at campus. 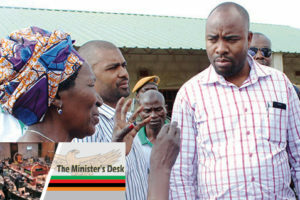 Muntu â€“Umo managed to perform his roles successfully as a family man, a teacher and a student over the next six years. After four years of successful long distance training. The â€œmatureâ€ student finally moved to main campus and completed his final two years. In 1997, Muntu-Umo graduated with a credit, in Bachelor of Arts with education. The graduate teacher was immediately posted to St Monica Basic School in Lusaka, where he taught English and French. After teaching for a year, Muntu-Umo was promoted to the position of deputy headteaher. He was later transferred to Namando Basic School in Lusaka in the same capacity. And in 1999, Muntu-Umo was again transferred to a neighbouring Lilanda Basic School as deputy headteacher. Four years later he was promoted as the schoolâ€™s headteacher, a position he held until his retirement in 2011. Muntu-Umo currently runs his own Haven University College where he trains secondary school teachers. He owes his teaching legacy to Mr Chali the head teacher at Mubili Primary where he taught for the fist time. Muntu-Umo who is himself a student of philosophy believes learning never ends and that philosophy is the mother of all subjects.